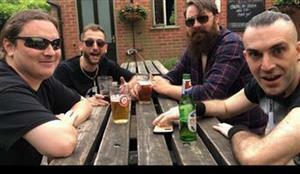 Ritual are a bluesy, ballsy hard rock band from Welwyn Garden City in Hertfordshire. Our sound is a punch drunk blend of groove laden riffs, pummelling percussion, funk infused bass lines and howling vocals. Influenced by a diverse range of artists and genres, we endeavour to write infectiously catchy hard rock songs with a distinctly Home Counties flavour. Storming our way to the grande final of Metal 2 The Masses Hitchin 2018, we have have been described as “Faith No More jamming with Mastodon” and enjoyed a triumphant first year as a gigging band. Ritual look forward to the opportunities that the future holds and are actively seeking venues to decimate. Influenced by a diverse range of artists and genres, Ritual endeavour to write infectiously catchy hard rock songs with a distinctly Home Counties flavour.